Congrats, you’ve made the decision to list your home with Howard Hanna! Now it’s time to start the important process of preparing for open houses, pictures, and potential buyers. Decisions you make before putting out the “For Sale” sign and marketing your home are just as important as the ones you’ll make during the process. There’s a lot that goes into purchasing a home, and there’s a lot that goes into selling one, too. Before you start on anything else, gather all the pertinent paperwork. A potential buyer will want to know about routine maintenance, what your utility bills have been throughout the year, and other relevant facts. It also puts your home head-and-shoulders above others because it shows off how well you’ve maintained your property! Now is the time to take care of minor repairs you’ve been putting off, such as replacing or repairing broken or old hardware and installing those new door handles or faucets. Not only does it improve the functionality of your home but it increases the value, too! Every buyer wants to be able to see an investment, so make sure you have quality lighting in your home. Consider removing draperies, cleaning windows and getting new, higher wattage lightbulbs. If you’re feeling daring and have the time, you may even want to install accent lighting to highlight your home’s unique features. Whatever you choose, making your home more welcoming, brighter, and cheerier will ultimately make it more sellable. To appeal to a buyer, you’ll want your rooms to look open and spacious. Now is the time to go through your belongings and either donate or sell what you don’t need anymore. As an added bonus, you’ll have less to move and a home that’s filled only with the essentials, making it appear bigger. You want potential buyers who pass by your house to think it’s the gem of the street, not an eyesore. How you increase your curb appeal will depend on the season. For instance, in winter you’ll want to make sure walkways and driveways are shoveled and well lit, but in warmer seasons, you’ll want to make sure that the grass is cut and weeds have been pulled. Win points with a deep cleaning! No one wants to buy a home that’s dirty. Whether you hire someone or do it yourself, cleaning is one of the most necessary steps in preparing to list your home. There’s just no way around it. Remember that everything from windows, floors, and carpets to the garage, basement, and even the outdoor living spaces should be cleaned as thoroughly as possible. Now that you’ve done the work of making your space ideal, it’s time to grab the camera! Quality photos that accurately represent your home as it is now mean that more people will come to view the property in person. Your Howard Hanna real estate agent may even have a professional photographer to recommend who really knows how to highlight your home’s exceptional features. Preparing your home for listing will take some time and attention to detail. 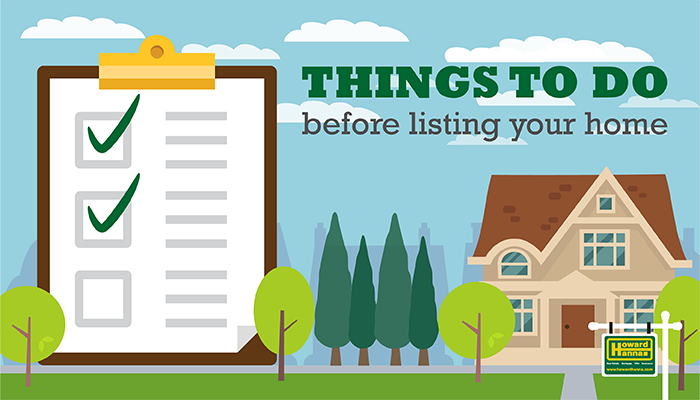 But by using this list as a guide and meeting with a Howard Hanna agent for a professional opinion, you’ll be well on your way to moving into a new home!